Your water heater is easy to forget about. Every morning you get up and take your shower, and hot water flows through your home just like it has every morning before, but as it does its job, your water heater is using valuable energy. There are some maintenance steps you can take to make it run as efficiently as possible and also extend its life. If you’ve been wondering what water heater maintenance Los Angeles HVAC pros recommend, here’s what the team at NexGen Air wants you to know. Hot water is a necessity, but you may not need the water to be quite as hot as you think. Every 10 degrees you lower your heater will save about 3 to 5 percent on your energy bills, and also keep your heater from working too hard. Instead of the 140 degrees most heaters are preset for, lower it to 120. However, don’t go lower, as too cool will allow more mineral buildup. One of the problems that plague water heaters is sediment and debris. Drain ¼ of the water in the tank several times a year to reduce this problem. Before draining, turn off the electric or gas to put out the pilot light, then hook up a hose to the drain and run for 10 to 15 minutes. Insulate all exposed hot water pipes. This will help in two ways. First, it will stop heat loss. Second, it will help your water to arrive hotter at the faucet. This means less time running the water waiting for it to warm, so not only will you lose less heating energy but you will also lose less water. Putting an insulation blanket around the water heater will improve its efficiency, particularly if you have an older unit. In fact, you could see a 45% reduction in heat loss with this addition. If you have a family with four people, and each of those four people showers for five minutes a day, you will use 700 gallons of water a week. That’s a significant amount. To make your water heater more efficient, use less hot water. Low-flow showerheads and faucet aerators in bathroom and kitchen faucets will help. These steps can reduce hot water use by up to 60%. Have a professional HVAC technician inspect your water heater once a year. This will ensure that any small problems that are developing are addressed before they hurt the systems efficiency or cause a system breakdown. The T&P Valve release pressurized hot water when the pressure builds to a high level inside the tank. As it wears out, it may start releasing water too often. You can address this by either lowering the temperature in the water heater a few degrees or replacing a faulty or failing valve. Are you looking for a partner to help with your water heater maintenance? 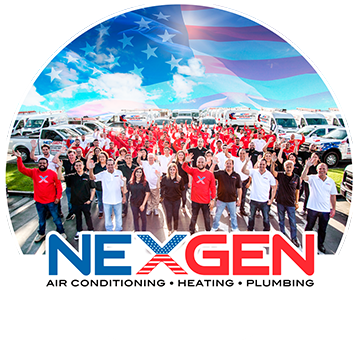 NexGen Air is an HVAC company in Los Angeles that offers a full list of water heater maintenance, repairs and replacement services. Contact our qualified team today to schedule your water heater maintenance services in Southern California.